This is the second part of an interview with Nupur Kittur of One Hot Stove. Be sure to begin reading with Part 1. Is the food served at Indian restaurants in the United States a good representation of the food in India? Well, how far does McDonalds represent American food? Yes and no, some of the features are there, but in so many ways it’s a poor representation of Indian food. The term “Indian food” is such a very incomplete and unsatisfactory one. India is a huge place and the most interesting thing in India is that every region in India is so unique - a different country in and of itself. It’s like if you crossed the street into Illinois and what if you had a different language, a different way of dressing, different customs, different festivals, and different food - how strange would that be? India is like that. You cross the state border and it’s something completely different. So, describing Indian food – you do that the best you can, but it’s not ever going to be satisfactory. I guess if you don’t have a choice, you can go [to an Indian buffet] and get a glimpse of a different cuisine, but they’ve never been things that I’ve been particularly fond of. What are some examples of how the cuisine varies by region? Many differences come about because of geography and history. You have a lot of cultural lessons in how cuisine has evolved. For instance, the north of India was the place where Mughal invaders (the Muslim kings that came from Arabia) came into India many centuries ago and they established regimes which had so many influences. This Mughal cuisine has a lot of mideastern sort of influences. 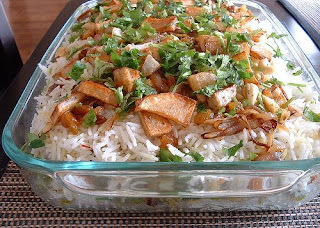 Cuisines that people are familiar with today, like the biryani (the rice dishes) and a lot of the meat dishes, have come from those influences. India is a subcontinent and you have a huge coastline which leads to the heavy use of coconuts. Wherever you grow coconuts, you use every part of the tree – the oil and the meat from the coconut. You use coconut water. You use every other part of the coconut. A lot of coastal cuisine is fish-based, and coconut-based, and uses very mild spices. There are a lot of cream-based dishes from the North. There are also religious differences. The west of India has a lot of cultures that don’t eat meat, so they’ve evolved a cuisine that is uniquely vegetarian. In fact, there is a particular religion (Jainism) that doesn’t even eat garlic and onions. They’ve evolved a whole cuisine that evolves around having wonderful dishes that do not use meat, onions, or garlic. You have so many regional dishes that it is really a challenge to understand them. Where I come from, for instance, it is a region that grows a lot of peanuts so you have so many peanuts being used in cooking (for example, salads with crushed peanuts sprinkled on them, which is not that common in the rest of India). There is one little state that is to the south of where I come from that was a Portuguese colony until just a few decades ago, so you have almost an Indo-Portuguese fusion cuisine there. It’s very interesting. Based on what you just said, do you think there can ever be an “Indian restaurant”? I don’t think so, but I don’t want to sound elitist. There is nothing wrong with people enjoying standard Indian food. People like it and I think that’s great. You have to understand that you can be at a buffet and enjoy it, but remember that this is not the complete picture - that’s all I am saying. I really do believe that you cannot have something as an all-Indian restaurant unless it is a total potpourri. You shouldn’t sell it as something that is completely Indian. In some parts of the U.S., you have very regional Indian restaurants because there is a market for them; and in some other parts of the U.S., the time has not come yet, but I guess maybe soon. Are there foods that you enjoyed in India that you can’t make here? Almost nothing that you would make in India you can really make using ingredients in an American supermarket. Having said that, Indians have lived in the U.S. for three or four decades. Indians have migrated here for jobs or to study and many have lived here their whole lives. You have now a really vast network of Indian stores in the U.S. It is ridiculously easy to go into a store that looks almost like a store in India where you can find all the basic groceries that you would need. Of course, there are things that you would never find here. For instance, the import of many Indian mangoes was banned in the U.S. for many, many years. This year, the ban on alphonso mangos (one of the most prized mangoes in India) was lifted. People who live in the U.S. can definitely do their regular cooking, but there are some things that really are very specialized that you probably wouldn’t find in the U.S. and I’m OK with that. I recognize that I live in a foreign country. I’m definitely not one of those people who is interested in cooking the same food that I would make in India. I’m more excited about using local vegetables and cooking them my way, but everybody is different. There are some Indians that live in the U.S. who really miss vegetables that are Indian, so they will go to Indian stores and buy all of their vegetables there. What is an example of a time when you used a local ingredient in an Indian style? I cooked something this afternoon – swiss chard. Chard is not something I’ve seen in India. I just cooked the chard into a dal this afternoon. Yesterday, I cooked paddy pan squash in an Indian style. I shop at the farmer’s markets that everybody else here shops at. These were giant paddy pan squash – so juicy and yummy! 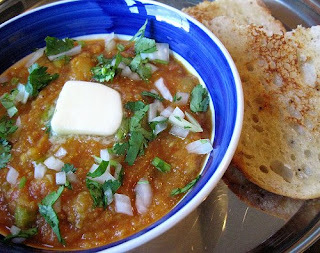 Nupur's favorite dish, Pav Bhaji. I must confess, I do have favorite dishes. My favorites are street food in India because they just taste so good. There is one dish called Pav Bhaji and that’s a dish that I used to love going to a little hole in the wall restaurant in Bombay and eating for many years. I really missed it when I came to the U.S. I would make it at home, but it would never taste quite the same. On one trip to India, a friend of my mom’s gave me her recipe for it (which is just a spot-on duplicate of what the restaurants make). You know how sometimes restaurant food is very hard to make at home just the right way. You can make it, but it just never tastes the same. But, she gave me the recipe and I blogged about it a couple of years ago and it is by far the most popular recipe on my blog and it will always be. Everybody loves it and even people who don’t come from my part of India make it and they love it. People who come from my part of India will write me emails that say, “Thank you!” just the way that I said, "Thank you!" to the aunt who gave me this. When I was in New York, I would still cook a lot at home as a grad student. It was very cost-effective and convenient to me to just make my own meals. I was cooking on a more or less everyday basis and I would of course Google for recipes (as everybody who cooks almost does). I found one cooking blog and I thought, “What is this?” The concept of a blog was very new to me. I realized that there was something called a food blog. There was a blog event even way back then in 2005 called Is My Blog Burning. The theme that month was beans, and it was hosted by Kathy of My Little Kitchen. I eat beans on an everyday basis and I love them, so I timidly sent her an entry (I didn’t have a blog of my own) and she posted it on her blog with a picture. A week later, I started my own blog. I didn’t think it was going to be anything. I just started doing it because I was going through a very stressful time (grad school was very rough). You are so caught up in your work, and you are so unhappy a lot of the time because you are busy and stressed out. This was my little outlet, my secret life, or some escape from reality. I didn’t expect it to be anything whatsoever. I wasn’t thinking at the time. I still don’t think my blog is anything big or anywhere as big as most blogs that started when I started. I’ve never promoted it because I don’t want to be a big blogger. It’s always been, if you like, come and read it - enjoy yourself. That’s the end of that. I don’t want to make it a career or anything beyond a hobby because that would mean a second job. I don’t need another job. I’ve kept it low-key. I don’t do things on my blog that I don’t enjoy. I don’t do anything because I feel like I have to. Has the blog changed the way that you cook? You can’t help a blog changing the way you cook. I have to say that some of these blog events that come up really make you want to try new things. You change the way you look at ingredients. It is something that gives you a sense of purpose, because otherwise you can get stuck in a rut when you are just cooking for you and your family. Having a blog makes it exciting because it is something that you can share with somebody else. I learn more from my fellow bloggers than I do from anybody else as far as cooking is concerned - more than cookbooks, networks, or food magazines. What blogs other than your own would you recommend to someone who wants to get started with Indian cooking? There are too many. I would say, don’t think of a blog. Here is the thing with most blogs (not just Indian blogs): they assume that you have some background knowledge. I can’t think of any blog that is really, really basic. Most bloggers start doing it when they have reached a certain level of cooking themselves. I know so many people who are like, “I want to make aloo gobi,” and that’s their whole thing. That’s great because that gives you a starting point. Then, you look for a recipe and maybe you look at three or four and maybe you follow one or decide to combine a couple. You can’t rely on a blog to teach you to cook. At least me, I’m not going to tell you have to dice onion. I really can’t. Google is your friend. If you want to learn how to dice onions, you can always type “dicing onions” and find a video to learn how to dice onions. Recently, you’ve been doing lots of knitting. How does knitting compare to cooking? It’s very different. Cooking is something that I think of as a life skill and knitting is a real hobby. I don’t think cooking is a hobby at all. I tell anybody who tells me that cooking is a hobby, “I don’t really understand.” I feel like you have to know how to cook - just like doing laundry can never be a hobby because everybody has to do laundry. In this country, maybe you don’t have cook. You can go out and buy things at the supermarket, but I think that’s very artificial. You have to eat every day so you have to know how to cook. I don’t mean cooking four course dinners. I mean cooking good, nutritious food that you feed yourself. In that sense, cooking is something that is a life skill - more about something that you do because you need it to live. Knitting is a real hobby, as far as I’m concerned. There was a time where people couldn’t wear a sweater unless they knew how to knit it, but today not so much anymore. Food blogging is definitely a hobby and it’s very time intensive. Because I’m enjoying knitting so much, I’m going to cut down on blogging starting in fact next month. It’s satisfying, but three and a half years is a long time. I’ll start by saying this. I’m not a very people person. I know that you like meeting people and talking to them. I’m not necessarily like that, so this is not something that is naturally coming to me. I’m very shy with people most of the time. I would really like to learn more about somebody that really grows my food. For instance, I would love to have an interview with the small farmers who sell produce in Soulard or any farmer’s market. I really think they are the people who are working so hard behind the scenes to put food on our tables and I don’t think throwing down a couple of dollars and picking up a bag of vegetables tells you anything that goes on behind the scenes. We had this weird weather earlier this year and Channel 5 (the local news) interviewed a farmer on TV. He was actually the guy that I always buy my greens from in Soulard and I was like, “Hey, that’s our spinach farmer!” He was saying how their spinach plants are drowning because we had all of this unseasonal rain and I was like, “Oh my God! He’s in trouble!" I felt very bad because I go to the market and say, “Oh – there’s no spinach today!” and I’ll go and buy Dole spinach in the supermarket. I guess I’d love to have more of their side of the story because I think that these are people who don’t necessarily have fancy food blogs or fancy food photography. I think their voice is not heard as much as some other people. That was a great interview! I've never been much into Indian food, but reading about the food and culture was very interesting. I enjoyed hearing about Indian food culture and also Nupur's approach to blogging. Thanks for the interview! Now I've got to check out her favorite dish. Nupur's blog is the first one I turn to when I want to discover more about Indian cooking. It's a treat to read this interview and learn more about the person behind the blog. Nupur has always been someone i always wanted to meet after my school days with her. Her blog has been a delicacy to me, to meet her in her 'blog-kitchen' was something like a "cherry on the cake"!! Reading Nupur again and see her in her kitchen is the next most awaited event!! What a great interview! I'm a huge fan of Nupur's blog - the recipes, the way she's categorised them, her lovely honest way of writing. I've always thought of her as down-to-earth, sweet and very intelligent, just from her blog - and this interview just proves my assumptions! I love Nupur and her blog. It was very nice to know her through her blog. I'll miss her. What a great interview!!! Nupur's blog catalogues homestyle recipes and stories that makes you want the same experience- her blog and the interview showcase honesty and genuineness. Bravo! Thanks Nupur for your recipes. You are great inspiration and the way you describe the steps, one wants to make the dish rightaway. Continue to share your receipes with us. Have a great holiday season and New Year.